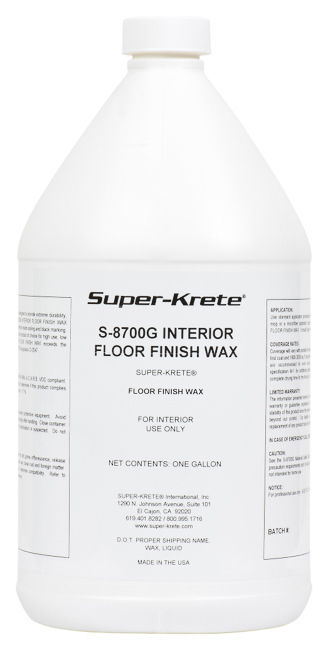 S-8700 Interior Floor Finish Wax is an interior floor polish designed to provide extreme durability, thereby reducing maintenance cycles. Interior Floor Finish Wax also provides a rich gloss, non-yellowing film which resists soiling and black marking. Interior Floor Finish Wax is the product of choice for high use, low maintenance floors. Interior Floor Finish Wax exceeds the Coefficient of Friction safety standards of ASTM Designation D-2047. Coverage is approximately 2,400 sq. ft. per gallon (light coat).